~NEW~ in our expanding line of beautifully crafted recovery clocks is this Deluxe Maple Serenity Prayer Clock. 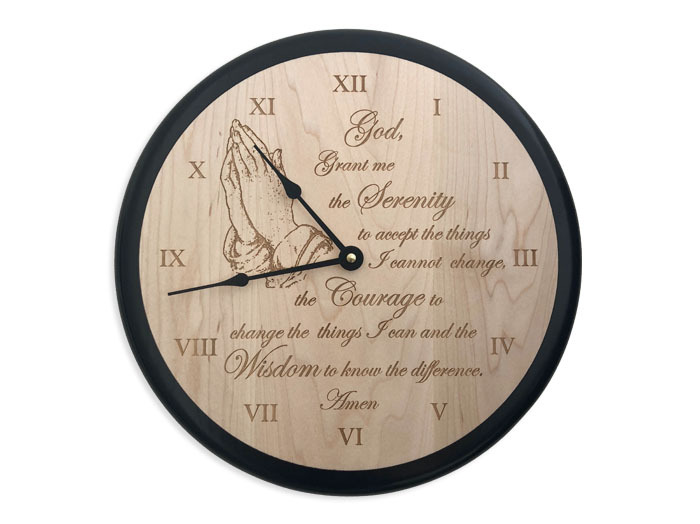 Each of these stunning maple clocks has our Serenity Prayer and two hands clasped expertly laser engraved into the face of the clock. A stunning black frame is stained around the edge of the 12 inch diameter clock. Pictures just don't do this beautiful clock justice! 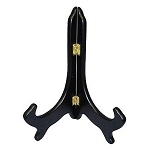 Each clock is key-holed on the back side making it simple to mount on a wall or any flat surface. 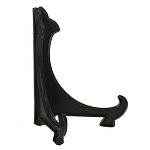 Optionally, consider one of our Display Easels for displaying your clock on a shelf, table, or desk! Please note: These beautiful clocks are laser engraved. The contrast of the engraving is dependent on the natural characteristics of each individual piece of wood. Yours will be a one-of-a-kind, unlike anyone else's in the world! We do not employ color fill techniques to increase the darkness/contrast of the engraving - opting instead to allow the beauty of each piece of wood to bring into being a special and unique piece of art for you to treasure for years and years.